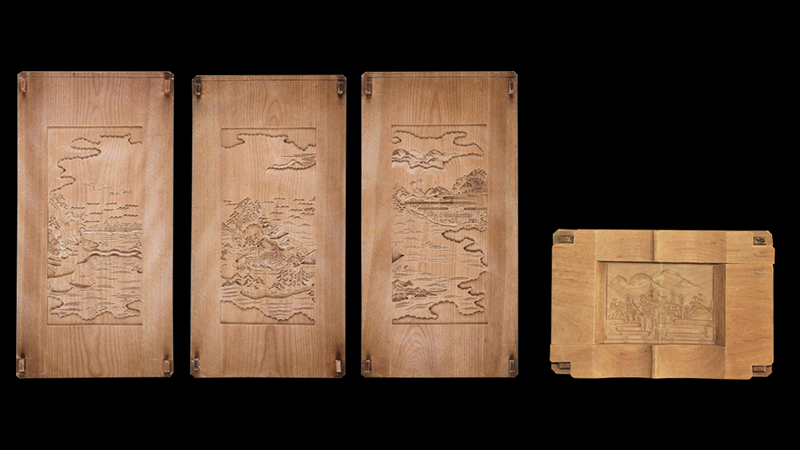 Depictions of Wakanoura from folding screens with paintings of Wakanoura and Itsukushima. This work, which dates from the first half of the Edo period, is characterized by dark color and elaborate execution. Most of the trailing bronze mica consists of gold leaf. Single, six-face screen; color on paper. Wakanoura has been featured on many famous painted folding screens thanks to its reputation for being as beautiful as the three places that are traditionally considered to be Japan’s three most scenic. In modern times, Tosho-gu Shrine has figured as the subject in many of these works. With the advent of the Edo period, the Kishu Tokugawa, one of the three branch families of the Tokugawa house and second in rank and prestige only to the branch of the family that provided the shoguns themselves, became the rulers of the Kishu domain. 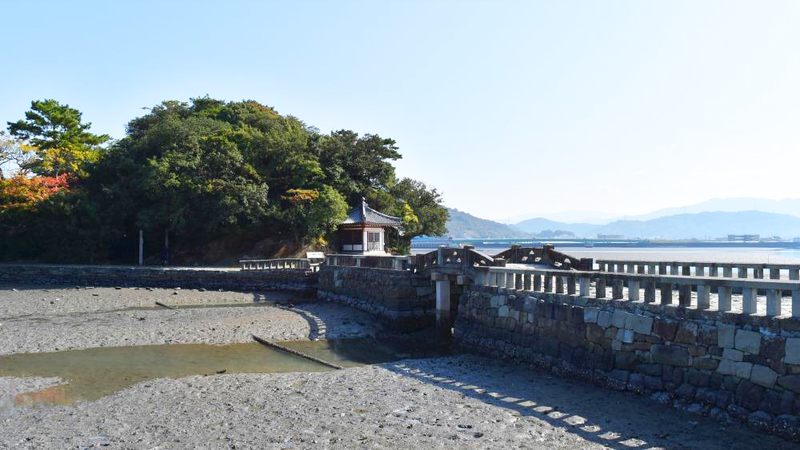 The scenic beauty of Wakanoura enchanted generations of rulers. In 1619, Yorinobu, the 10th son of Tokugawa Ieyasu, occupied Wakayama Castle as the first ruler of the Kishu domain. 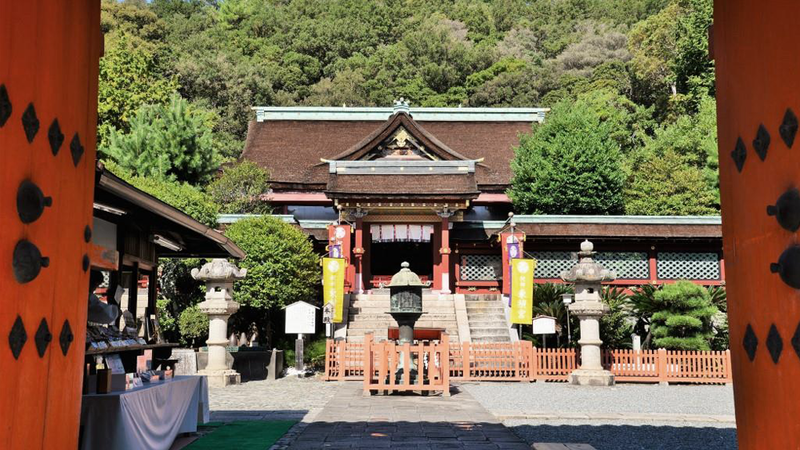 In 1621, he built Kishu Tosho-gu Shrine to enshrine Ieyasu on Mt. Gongen in Wakanoura. The following year, Yorinobu started the Waka Matsuri Festival as a regular celebration. Furo-bashi Bridge was built during the second half of the Edo period as a route to be used by high-ranking attendees during the festival. 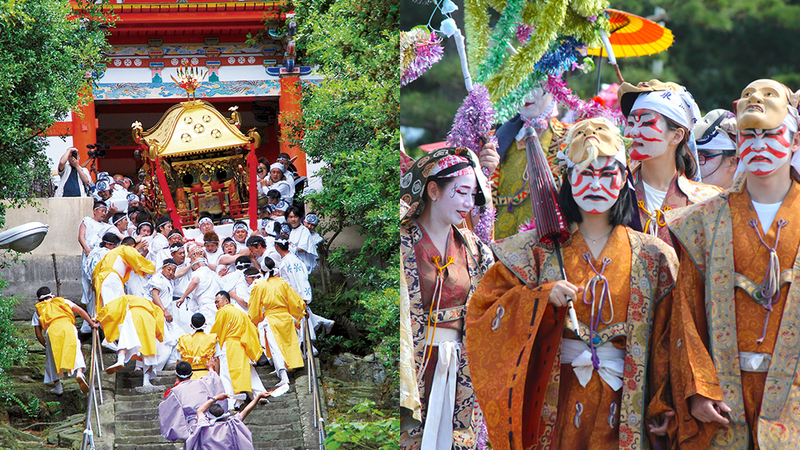 The event continues to be held today, with a portable shrine being carried down the 108 stone steps of the steep pilgrimage route in a richly theatrical performance that evokes Japan’s Age of Civil Wars. The procession of 1,000 people creates a living picture scroll as it snakes its way through the town. Paintings on folding screens and picture scrolls depict the Wakanoura of that time, spurring memories of bygone times. Harutomi, the 10th ruler of the Kishu domain and its greatest man of culture, built Yosuien Garden as a daimyo garden with a shioiri-style design that fed its pond with seawater and a layout that effectively utilized the landscape of Mt. Takatsushi and other nearby mountains. He also built a tea house in the garden, and his deep love of the area is evident in its use of Wakanoura-shaped confections and utensils. This shrine was built by Yorinobu of the Kishu Tokugawa family, the first ruler of the Kishu domain, to enshrine his father Ieyasu. It is known as the “Nikko of the Kansai region” for its gorgeously decorated main building. Each May brings a large shrine procession to the shrine as part of the Waka Matsuri Festival. This pagoda occupies the site on Mt. Imose where Yojuin, the mother of Yorinobu, who was the first lord of the Kishu domain, buried a pebble on which was inscribed a verse of scripture on the 33rd anniversary of the death of her husband Ieyasu. Yorinobu subsequently built the pagoda here to pray for her repose. Built by Tokugawa Yorinobu, the first lord of the Kishu domain, Sandan-kyo Bridge, which connects Mt. Imose to the mainland, is the oldest stone bridge in the prefecture. It is modeled on the West Lake Causeways, a sightseeing district in China. The bridge was built for use by people of high rank such as members of the Tokugawa family and officials from Tosho-gu Shrine during festivals and other functions. 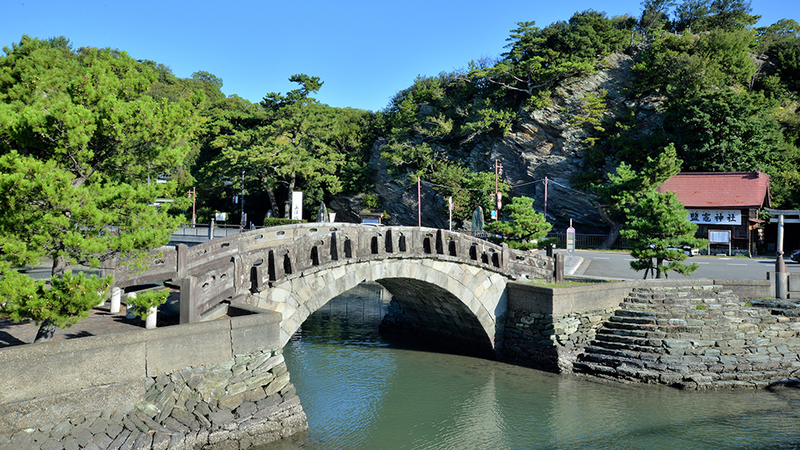 This stone arched bridge was constructed for use by persons of high rank during the Waka Matsuri Festival at the order of Harutomi, the 10th lord of the Kishu domain, in 1851. The balusters feature beautiful engravings with a cloud pattern. Cost, hours, and days closed: The bridge is open to the general public. Harutomi enjoyed tea here in the daimyo garden. The Yosuitei tea house sits on the banks of the garden’s pond. Set against Mt. Takatsushi and a number of other mountains, this magnificent garden was built by Harutomi of the Kishu Tokugawa, the 10th ruler of the Kishu domain. 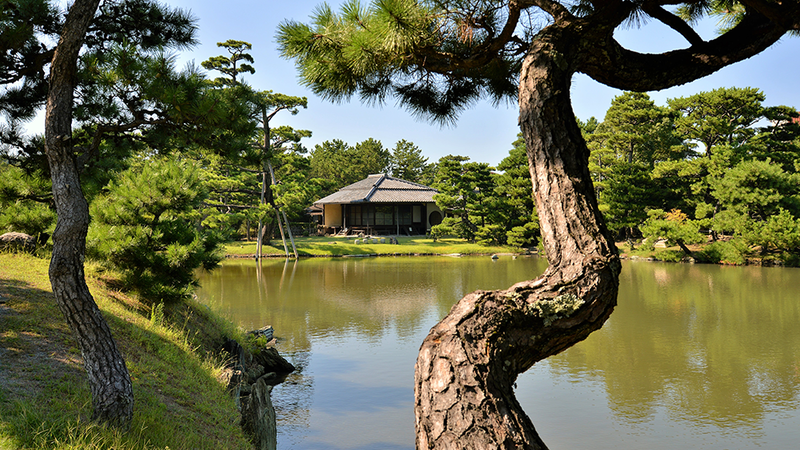 As a daimyo garden, it is extremely rare in its use of the shioiri design, in which the pond is fed with seawater. Getting there: Located 7 min. on foot from the Yosuien bus stop. 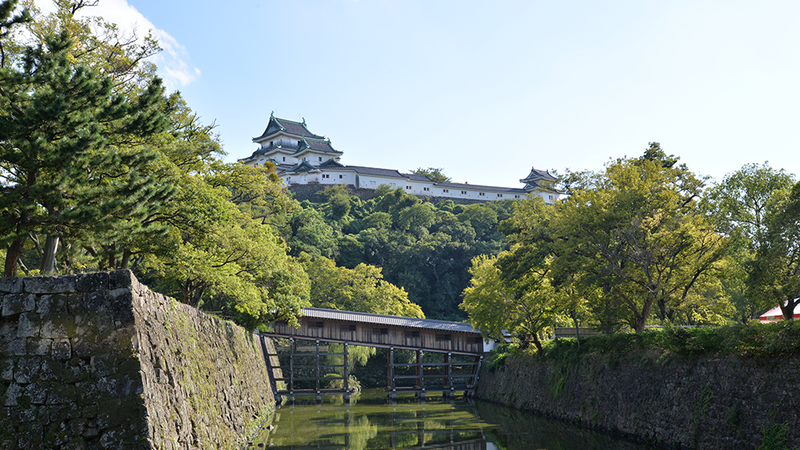 You can photograph the covered bridge across the castle’s moat along with its keep in the background from a spot near the Wakayama City Office. Built at the order of Toyotomi Hideyoshi by his younger brother Hidenaga, Wakayama Castle was occupied by the Kishu Tokugawa family during the Edo period. Its keep atop Mt. Torafusu provides sweeping views of the city of Wakayama below. Getting there: Located in the immediate vicinity of the Koenmae bus stop. Cost: Admission to the keep, \410; admission to the covered bridge over the moat is free. Closed: The castle’s grounds are open to the general public (some areas charge admission). Left: The tomb of Yorinobu, first ruler of the Kishu domain, sits deep in a solemn forest. 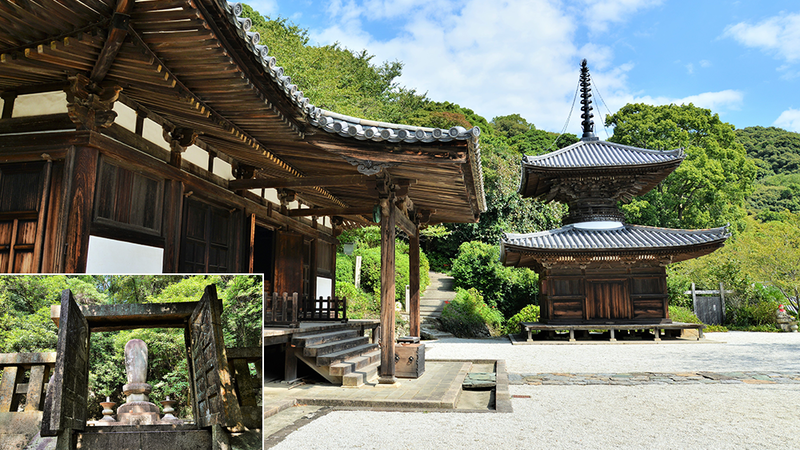 Right: The main hall, two-storied pagoda, and gate of Choho-ji Temple —all National Treasures—were built from the Kamakura period to the period of the Northern and Southern Dynasties. 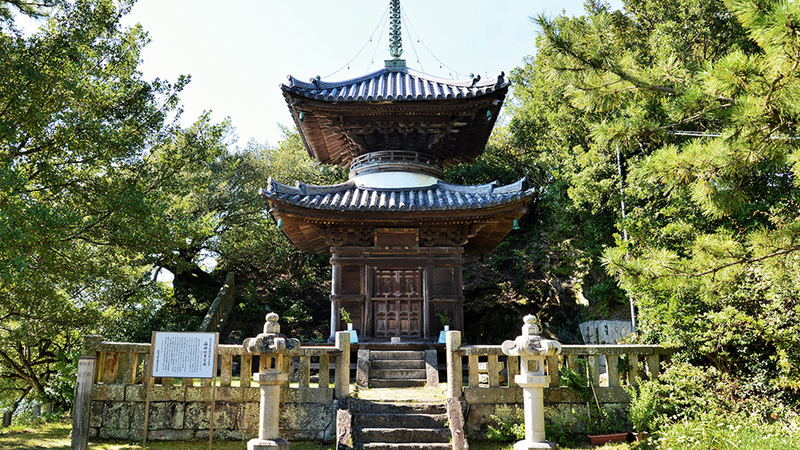 The main hall, two-storied pagoda, and gate of this temple, which was built by the order of Emperor Ichijo, have been designated National Treasures. It serves as the family temple of the Kishu Tokugawa, and a mausoleum holding the remains of generations of rulers from the family is located in a solemn forest deep on the temple’s grounds. Getting there: Located 10 min. by car from JR Shimotsu Station. Surugaya has been producing candy since the Muromachi period. The company moved to Kishu with Yorinobu, the first lord of the Kishu Tokugawa family, to supply the ruling house with its products. Harutomi, the 10th ruler of the Kishu domain, had the company create candy decorated with famous scenes in Wakanoura.